I've reached the stage in life when I start to get misty-eyed over the technology of my youth. 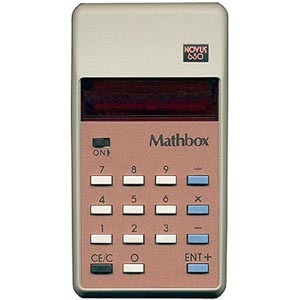 My first calculator was a Novus 650 with tiny but perfect LED displays under plastic bubble lenses. 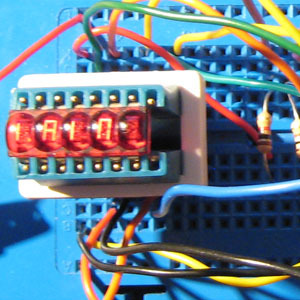 These come from the first generation of 7 segment displays and go back to the mid 1970s. Like Nixie tubes there is something oddly beautiful and nostalgic about this obsolete technology. I was delighted when I found a 5 digit example of these displays in an odd-box of bits that Mike Harrison kindly gave me. 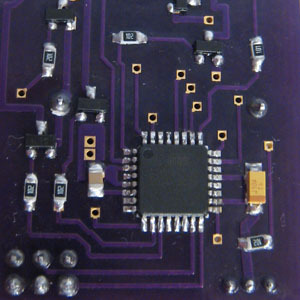 It had obviously been hacked out of a circuit board because most of the pins were cut near the body. The excellent DecadeCounter site suggested it was an Hewlett-Packard 5082-7415 and with data sheet in hand I found all the segments still working. Now I knew I had a working display I really wanted to make a little gadget with a cute retro feel. I am a big believer in keeping things simple, so for the prototype I decided to use an Arduino board to drive the display. Because the pins on the display were damaged it wouldn't fit in the breadboard so I clipped it in to an IC test-clip mounted upside down to provide contact. The circuit is very simple - just transistors to pull down the cathodes and the anodes driven from the Arduino through a resistor. The program to drive the display is only a few lines. For the final version I wanted to have something that matched nicely the compactness of the display. 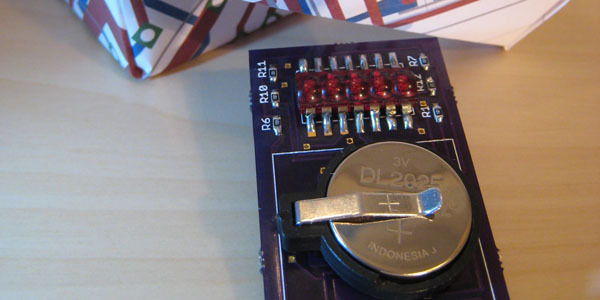 This meant using a button-cell for power and surface mount components. 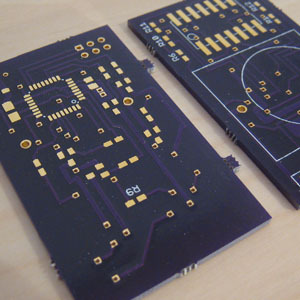 I did a PCB layout in Eagle based on the TQFP version of the ATMEGA168 controller. At first glance I wasn't sure I was going to fit all the components in to the space I wanted, but once I got tweaking it all came together nicely. Actually once I got the boards I think I might have been a bit conservative - could have made things even smaller with a bit of effort. Because of the damaged pins I decided to "dead bug" the display at the top of the board. I am really pleased with how that looks in the finished version. The boards were made by the friendly helpful (and very cheap) DorbotPDX service. I was really pleased with the quality and the special purple finish. Soldering the CPU was a bit tricky, but plenty of flux and solder wick sorted everything out. The rest of the assembly when quite easily and everything worked first time. I wanted to use the gadget as a kind of personal item like jewelry and I originally thought I would program it with a valentines message for my girlfriend. Unfortunately the whole project took much longer than expected and it ended up being an Easter present for her instead. As wrapping I made to origami boxes from printouts of the PCB layout. The final result is quirky, retro and rather fun. It's one of my favourites out of the things I've made. Up till the end this project didn't have a name. Clare and I brainstormed names over dinner one evening and came up with "Personal Electronic Retro Telegram (P.E.R.T.)". It's descriptive and could well be the name for a real 70s gadget. Interested in having your own P.E.R.T.? 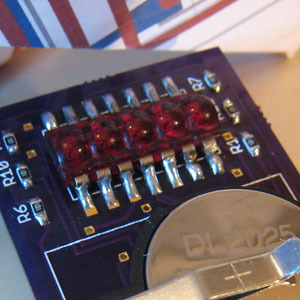 I think I can source the parts to make a few more of these modules. If you are interested in having one with your own custom message then contact me using the form below. I should say that the price will be fairly high reflecting the difficulty in sourcing the display and the hand-crafted nature of the item.